On December 2, 2017, while we celebrate National Mutt Day, that day when we acknowledge the union of pure-bred and non-pure-bred dogs that produce the most common type of canine of all, the humble but wonderful “mutt.” We are not talking about “designer” breed mixes here, either! No “labradoodles” or “puggles” need apply. In fact, we are not even talking about dogs at all!!! We are discussing the marriage of royalty and commoners, especially in light of the recent engagement of Britain’s Prince Harry to American divorcee and actress Meghan Markle. Prince Harry is the son of Prince Charles of Wales and Princess Diana, the younger brother of presumptive future heir to the throne, Prince William. Ms. Markle is actually Rachel Meghan Markle, born in Los Angeles in 1981. A Northwestern University graduate, Markle was married from 2011 to 2013 to a movie producer. Aside from being an American (Eww! ), and a divorcee, Markle is making history as the first woman of African descent (her father is Caucasian, her mother is African American) to marry into the British Royal Family. A mural by the US-born London street artist Pegasus depicting Markle (wearing a US flag-patterned dress and a tiara) flanked by two Queen’s Guards. Once upon a time (an apropos phrase when speaking of royalty), royal marriages were carefully orchestrated between the royal families of various regions and countries in order to provide blood bonds between kingdoms. Thus, European royalty became quite inbred and inter-related. When King Edward VIII of the United Kingdom chose to marry American divorcee (twice divorced), Wallis Warfield Simpson in 1936, he was obliged to abdicate the crown to prevent “scandal.” Edward was then created Duke of Windsor by his brother, George VI, prior to the marriage. 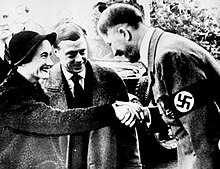 The Duke and Duchess of Windsor with Adolf Hitler, 1937. And yet, in 2005 Charles, Prince of Wales, married divorcee Camilla Parker Bowles, a commoner who would be known as “Queen Consort” if Charles attains the throne, and not as the “real” Queen. The marriage was approved by Queen Elizabeth II because the union would not result in any offspring that would be in line of succession to the throne. Charles, Prince of Wales, and Camilla Parker Bowles on their wedding day. 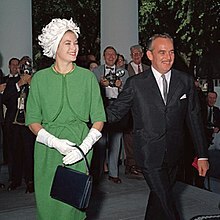 Another famous union of a crowned head with a commoner was the fairytale like marriage of Prince Ranier III of Monaco to American actress Grace Kelly in 1956. This marriage captivated the world and provided grist for the mill of every young girl in the world that dreamed a handsome prince would find and marry her! What you may not be aware of, is that the family of Grace Kelly was required to pay a dowry of $2 million in order for the marriage to take place. The Prince and Princess of Monaco arrive at the White House for a luncheon, 1961. Her son, Albert II, is the current reigning monarch of Monaco, half American though he is. Another American girl that married her way to the throne was Queen Noor of Jordan, born Lisa Halaby in 1951 in Washington, D.C.. She married King Hussein of Jordan in 1978, the fourth wife of Hussein, and mother of 4 of his children. 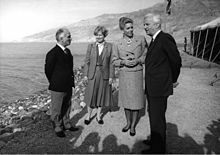 Queen Noor and King Hussein with Richard von Weizsäcker, President of Germany, and First Lady Marianne von Weizsäcker in Jordan in 1985. Her title was “Queen Consort” and she is now known as the “Dowager Queen.” Beautiful and highly popular, Lisa is the child of a Syrian American father and a mother of Swedish descent. The current King of Jordan, Abdullah II, is the son of King Hussein and his second wife, a British born woman. He in turn is married to Rania Al-Yassin, a girl of Palestinian lines. Like Queen Noor before her, Rania is likewise respected and popular. The “mixed” marriages we have mentioned here seem to have gone rather well for the happy couples involved, causing us to think the whole idea that royalty must marry royalty is not all it’s cracked up to be. What do you think? Should royalty stick to marrying royalty? Or perhaps, is the entire concept of royalty ridiculous? Please give us your opinions on the subject, and tell us of other notable royal-non-royal matches you find interesting. Stall, Sam. 100 Dogs Who Changed Civilization: History’s Most Influential Canines. Quirk Books, 2011.